How we reclaimed the Bard from BP – BP or not BP? Posted on January 11, 2013 by BP or not BP? On stage. Without permission. In iambic pentameter. The Reclaim Shakespeare Company had a dramatic 2012. Where will our guerilla thespianism take us in 2013, asks founding player Richard Howlett? 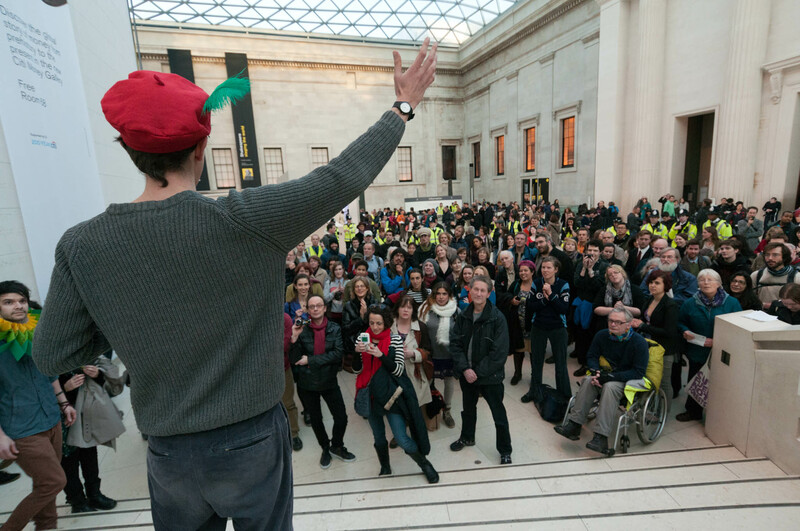 Richard in full flow at the British Museum flashmob last November. Photo by Kristian Buus. My boyfriend got some theatre vouchers for Christmas this year. If we wanted to go and see a Shakespeare production that was not sponsored by an oil company, we could. That was not the case this time last year. 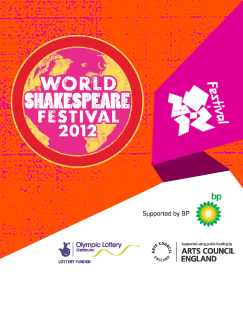 Back in January 2012 BP were proclaiming their sponsorship of the year-long World Shakespeare Festival, part of the arts bit of the Olympics, so pretty much every professional Shakespeare production in the land was in some way also acting as an advert for one of the most destructive companies in the world. BP like sponsoring the arts. It’s an easy way to distract the public from their massive contribution to climate change and increasingly terrifying activities in the Canadian tar sands, Gulf of Mexico, Russian Arctic etc. And they like to do it for the long-haul. They already have five-year sponsorship deals with the British Museum, the National Portrait Gallery, the Royal Opera House and the Tate. Quite a collection, eh? Following the Festival, the Royal Shakespeare Company (at which BP was directly sponsoring a series of plays) could have been a further gem in their clutch of British cultural jewels. But this has not happened. I think the Reclaim Shakespeare Company is at least partly responsible for this. So, how did we do it? It was exactly this time a year ago when my friends, Jess and Danny, came to my house for a post-Christmas meal. I explained to them one of my New Year’s resolutions was to get back into acting. It was ten years since I had finished a Drama degree and I yearned to be back on the stage. They had a brilliant idea that could combine my pursuit of a return to performing with the need to challenge the oil companies’ increasingly tight sponsorship stranglehold on the UK arts scene. The concept was simple: BP was trying to colonise our playhouses. 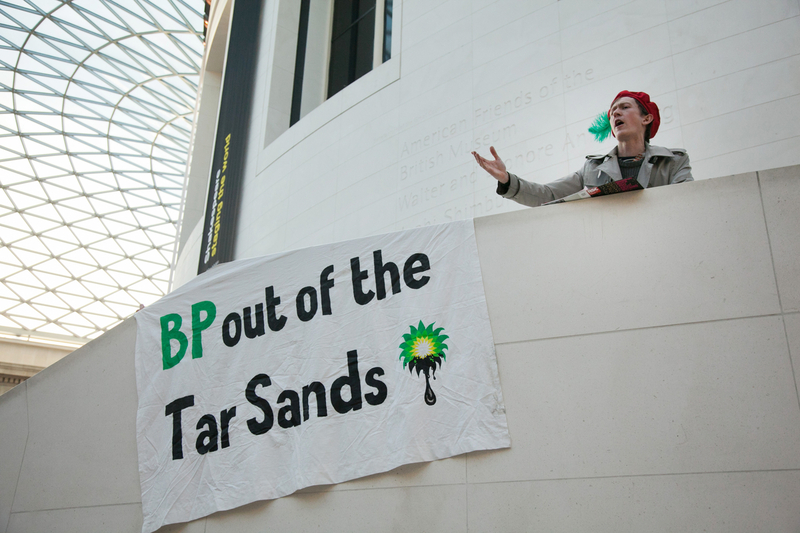 As people who love theatre and hate BP’s insanely damaging practices, we would carry out mini-rebellions – direct actions against their PR – in the very theatres they sought to conquer. On stage. Without permission. In iambic pentameter. Once we started talking to others about the idea we found our enthusiasm for taking on the oil giant through the novel form of renaissance drama was shared. Some wanted to write scripts; others to make props; many were nervous but excited at the prospect of acting on RSC stages. Thus, the Reclaim Shakespeare Company came into being. We gathered to read The Tempest. Our first ‘performance intervention’ was to take place at the RSC’s production of the play in their Stratford-upon-Avon base that April. A couple of us carried out a reconnaissance mission – surely the most civilised in direct action history. We went to see the play one evening, checking out possible entry points to the stage, how many staff were around, what the lighting was like etc. Inspired by the play, a two-minute speech was created for two performers. 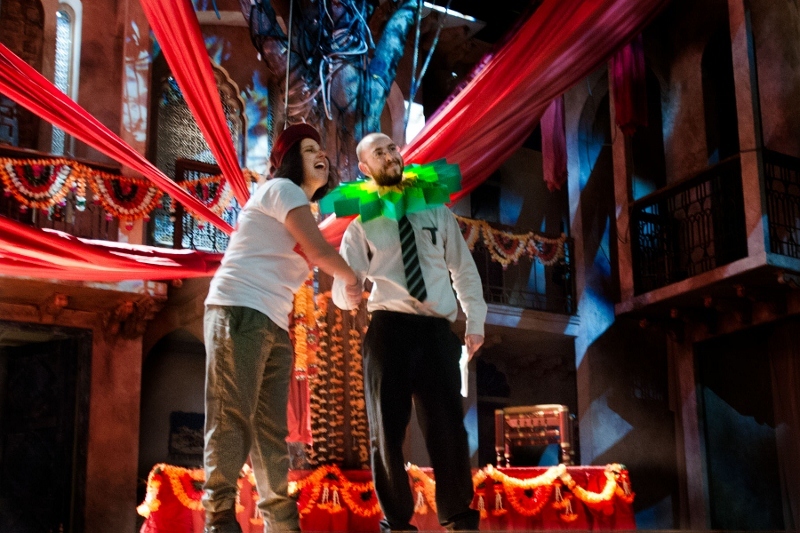 Costumes were hired, props made, rehearsals carried out. On the big night we casually wandered into the auditorium, showed the usher our tickets, and at around ten minutes before curtain-up, as most of the audience were already seated, we dropped our long coats, revealed our Jacobean finery and took to the stage. Our performance received much laughter, much applause and the odd boo. We wanted to spark a debate – and we had succeeded! 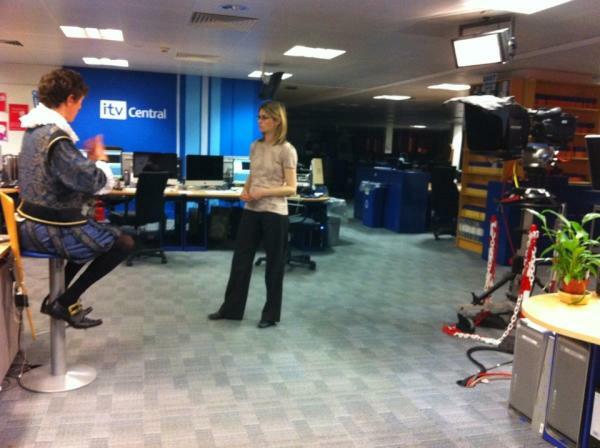 Richard, facing down the ITV cameras in doublet-and-hose! Photo by Zoe Broughton. That performance was the first of nine that the group went on to carry out during the World Shakespeare Festival. We performed in London’s West End, at the famous Roundhouse theatre (to an audience that coincidentally included many BP staff on a work outing! ), at the Shakespeare exhibition in the British Museum, and twice more in Stratford. We did monologues, duologues, casts of three; comedy, tragedy; verse and prose. 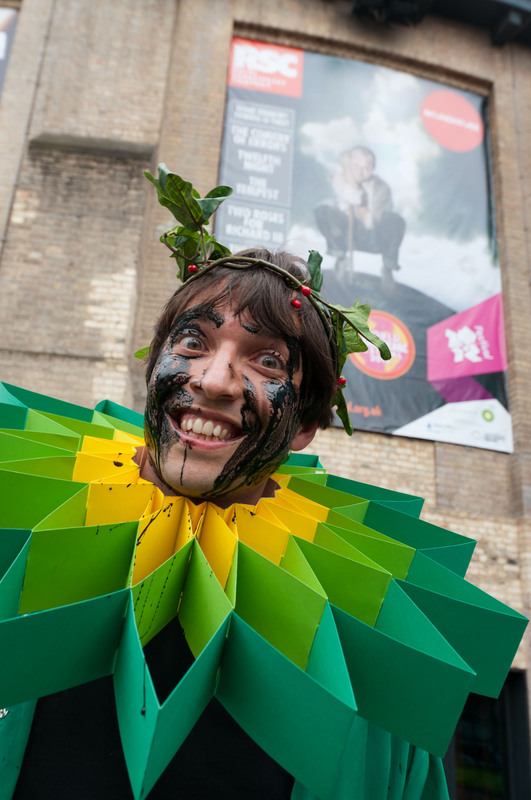 We made a giant ruff to look like BP’s famous logo and wore feathered caps at every possible opportunity. It was great fun and it was working. The famous BP ruff, modelled by Danny outside the Roundhouse. Photo by David Hoffman. Our audience stretched from those in the theatres themselves to the world beyond, via videos shared on facebook and twitter and media articles describing the events. The Independent newspaper ran a prominent article, and accompanying editorial suggesting Shakespeare would have supported our campaign; the Channel 5 chat-show The Wright Stuff held a debate entitled ‘Should BP back the Bard?’ In the theatre world high-profile actors and directors were giving us support: Mark Ravenhill and Mark Rylance spoke out against corporate sponsorship and some high-profile figures even met us to discuss an ethical code for theatres. 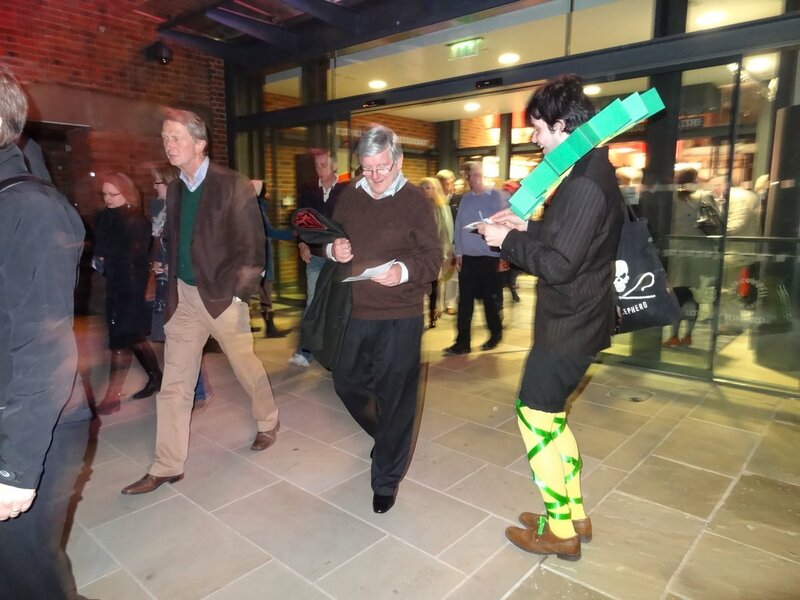 James flyering the audience after our Twelfth Night performance. In yellow stockings cross-gartered, of course. Photo by Zoe Broughton. Another crucial element of our success seemed to be the pure pleasure we gained from what we were doing. Whereas some campaigning can feel like a drudge and often lead to burn-out, this was enjoyable in and of itself. We were part campaign group, part theatre troupe, enjoying ourselves creatively in a cause we knew to be important. Sarah and Dave enjoying being on stage at the Noel Coward Theatre. Photo by David Hoffman. In our penultimate performance at the Noel Coward theatre in London the story of the campaign took a new twist. As the theatre’s heavies attempted to manhandle our actors off the stage, a member of the cast stepped in to stop them, as her fellow performers watched from the wings. Afterwards at the stage door we spoke to the actors and were heartened to hear of their support for what we were doing. 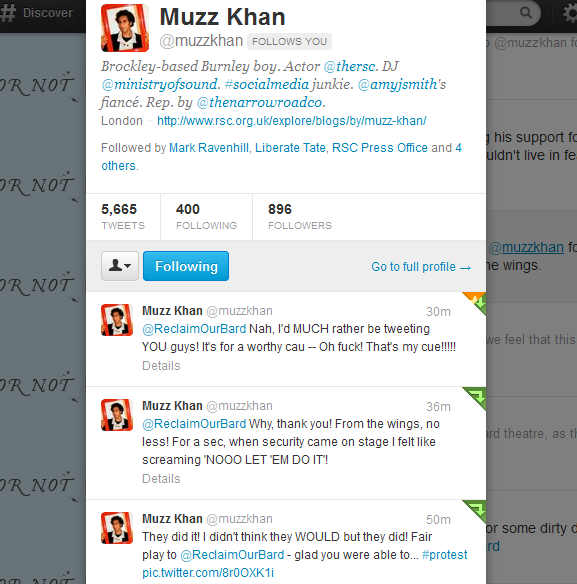 One of them had even tweeted praise for us from backstage during the second-half! As the Festival neared its end, it seemed we may have had a victory. The RSC made a statement confirming there had no further sponsorship plans with BP! Although they haven’t ruled out a future sponsorship relationship altogether, it seems they may have taken this opportunity to back away gracefully. We will be watching carefully to ensure the RSC stays free from the oily rogue’s clutches. We hoped fifty people would turn up. Incredibly, around 200 came, and chanted and chanted, filling the Great Hall with cries of ‘Out, damned logo!’. 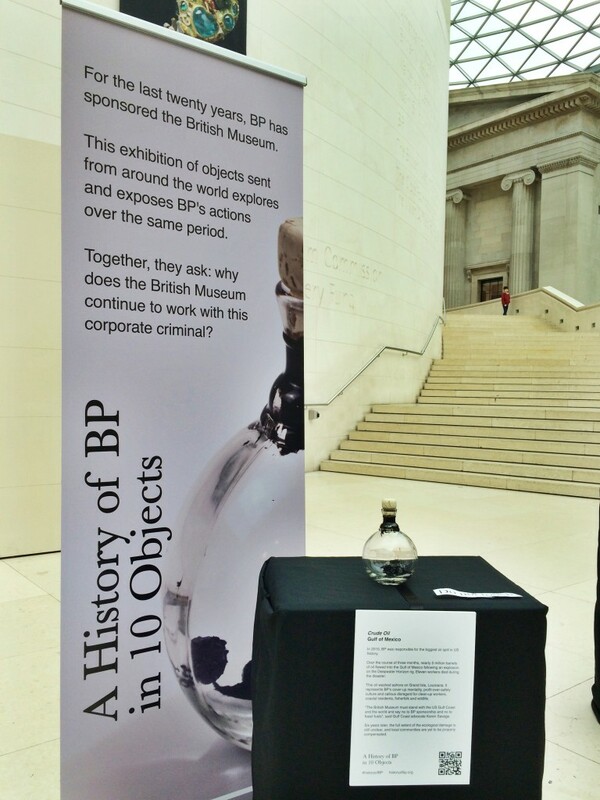 We finished the performance by symbolically banishing BP from the museum. It was a dramatic end to a dramatic year of creative, courageous and successful activism. What does 2013 hold for the Reclaim Shakespeare Company when it seems we may have reclaimed our Bard – at least for now – from the clutches of Big Oil? A gradual retirement via bit parts in Soaps? Amateur dramatics in our nearest village hall? Whilst BP continue to manipulate our country’s cultural institutions in order to greenwash their image?! We thinketh not! We will not allow oil companies to continue despoiling our beloved galleries, museums and theatres. The Reclaim Shakespeare Company have some new tricks up our frilly sleeves for 2013. We would love you to join us in our japes. To join our email update list and get involved in future performance interventions, drop us a line at info@bp-or-not-bp.org. ‘Out damn logo!’ The 200-strong flashmob in the British Museum. Photo by David Hoffman.